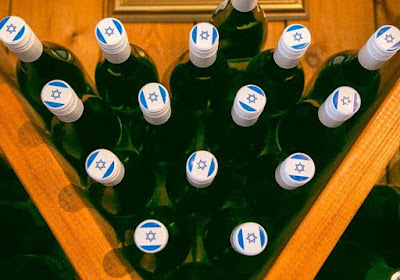 Boutique winery prints Israeli flag on tops of bottles set for export to Europe. (JERUSALEM POST)—A winery in the Golan Heights has decided to print Israeli flag emblems on the caps of bottles headed for sale in Europe, in "outright defiance of European boycott threats" on Israeli products made beyond the Green Line. The boutique Bezelet HaGolan Winery on Thursday announced its plans to print the blue-and-white hallmark of the Jewish state on the seals of Chardonnay bottles destined for export to countries in the EU. The winery's move came a day after the European Union published new guidelines on labeling what the body calls "Israeli settlement products." "We are proud of our national flag and hope that other wineries will follow our example and bare the Israeli flag on wine bottles destined for export to Europe," said the winery's founder and head winemaker Yoav Levy. The EU's position is that the territories Israel captured in the 1967 Six Day War-including the West Bank, east Jerusalem and the Golan Heights-are not part of the internationally recognized borders of Israel. As such, the EU views that goods from there cannot be labelled "Made in Israel" and should be labelled as coming from settlements, which the body considers illegal under international law. On Wednesday, Jerusalem suspended diplomatic dialogue with the body for a few weeks to strongly protest Brussels' decision to publish the legislation guidelines that allow member states to place consumer labels "Not made in Israel" on products produced over the Green Line.